Cleaning before moving out from a rental home can be a frustrating task. we often put off those little jobs and avoid cleaning until the very last minute. Unfortunately, it is a task that needs to be done. To make it easier for you, we have come up with a checklist to help you clean efficiently. Dust the ceiling, the ledges, the windows, and pretty much every surface. Take the nails and screws off the walls and ceilings. make good any holes with a good quality filler. Wash and wipe the windows. Clean the door knobs and the doors. wipe over the skirting boards. Check the carpets for any stains, maybe add some stain remover if needed. Wash the sink, make it shine. Disinfect the worktops and the hob. Wipe the front of the cabinets. Wipe out liners and cabinets. Scrub the refrigerators and disinfect it. If necessary, you can remove all the shelves inside. Scrub the oven and disinfect. If you need to remove shelvings, drip pans and burners, do it. If the property has a dishwasher, you can get sterilising tablets that do the trick. Clean out the extractor fan. gently! The bathroom is one of the places you would want to clean thoroughly. Here are some tips. Clean the mirror. This is the easiest part. Get a mirror or glass cleaner and wipe it off. If the extractor fan is dusty, vacuum out the surface. 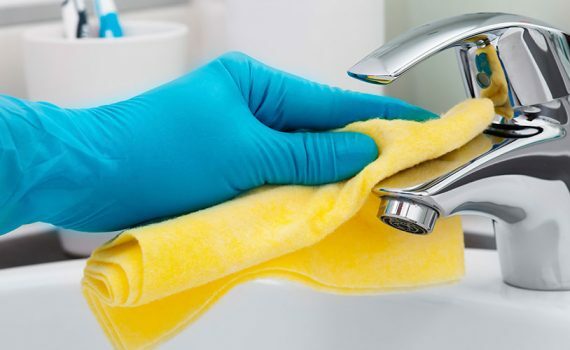 Scrub off the scum from the bathroom tiles and tub. Clean out the bathroom drawers. Get all the hair out and remove any liners. Clean the toilet, make it shine. The same goes for any worktop and the floor. Replace the sheets or the mattress if needed. That’s it for this list. Share your list with us in the comment section below.